Four young doctors team up for a transatlantic row for a good cause. What takes 32 days, 22 hours and 5,500 kilometers to complete? If you’re the four young men who set a new record when they arrived in Antigua on January 16, the answer is rowing across the Atlantic. The foursome consisted of junior doctors Seán Underwood (25) and Patrick O’Connor (28), podiatrist Eoin O’Farrell (26), and entrepreneur Thomas Browne (27). They left the Canary Island of La Gomera on December 14 along with 26 other teams competing in what is known as the world’s toughest rowing race. On New Year’s Eve three years ago, Seán asked Eoin if he would take part in the race with him. When Eoin agreed, Seán approached Patrick who also said yes. There was an incredible amount for them to do in the months coming up to the race. Tommy and Patrick had to learn how to row and all four had to spend time training. They also had to find a suitable boat for their ocean crossing. 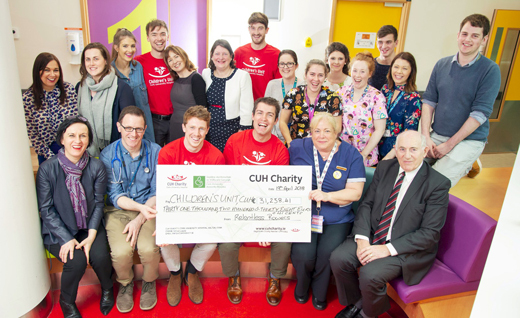 The rowing team presents their fundraising check to the Cork University Hospital Children’s Unit staff (Photo: Courtesy CUH). They also had to complete the courses that were required to participate in the race. These included courses in sea survival, ocean navigation, and first aid at sea. When the start day finally arrived, conditions were quite stormy at sea. Eoin remembers it all vividly. That wasn’t to last long. “Our auto helm was wrongly calibrated and it directed us back towards La Gomera so that lost us a few places,” says Eoin, ruefully. Something else went wrong on that first day. The emergency beacon was set off by accident and when the coast guard tried to reach them, it couldn’t make contact. Once those initial problems were dealt with, the four settled into a routine. They worked in pairs, taking two hours on and two hours off. Sharon Ní Chonchúir lives and works in west County Kerry, and much of her writing is concerned with the changing face of modern Irish culture. She is a fluent Irish speaker.